Discussion in 'EthConGateway by Joshua 1 Systems' started by Jeff, Nov 3, 2013. First of all this forum is a wealth of information and all the guides are awesome, especially for a newbie like me. This is my first time trying anything with RGB pixels or light sequences for that matter. Any help would be much appreciated, so I can stop pulling my hair out. I purchased a j1sys ECG-P12S and a couple strands of WS2811 pixels for testing until I can figure this stuff out. My issue is that I am trying to use Vixen 3 ver 3.0.7 and I cannot get any sequences to start. I must have some fundamental configuration messed up. My pixels work in test mode on the ECG-P12S, but I believe I’m having issues with some configs. The vixen preview mode seems to play my test sequences but I cannot get it to play on the controller. How to I tell Vixen to output the sequence to the controller? I have one pixel strand on P12 with 50 pixel nodes and one strand on P11 with 25 pixel nodes. My ECG-P12 strand configs are as WS2811 on the controller. Any ideas or help would be great. Thanks. First of all, I'd recommend that you update to version 3.0.9 - it's faster and less buggy - with the proviso that you back up everything first of course. But yes, the configuration needs fixing. You have a total of 75 pixels for a channel count of 225, so in the Controller Configuration, enter 225 in the Channels box and click Update. 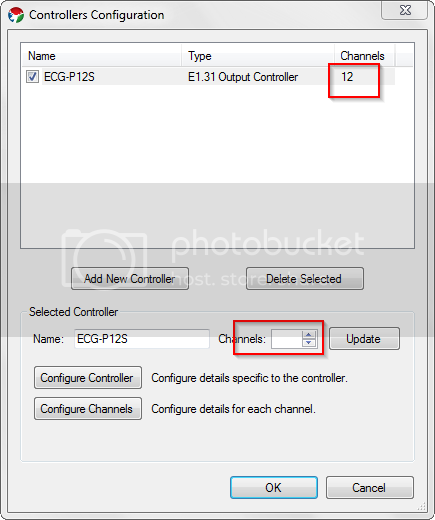 In the E1.31 Setup Form, the start value in a given row specifies the first channel number (within the total channel count for the controller) for the definition in that row. So your first row says that controller channels 1 to 150 are assigned to the first 150 channels of universe 12, but your second row re-assigns controller channels 1 to 75 to universe 11. Setting the start value in the second row to 151 should fix the problem.